We recently celebrated the launch of Octasolve Fuel Additive by doing something a little different – sponsoring Ian Harmon, as he took on the Coeus Insurance Management Everest Challenge for the Steve Prescott Foundation (SPF). 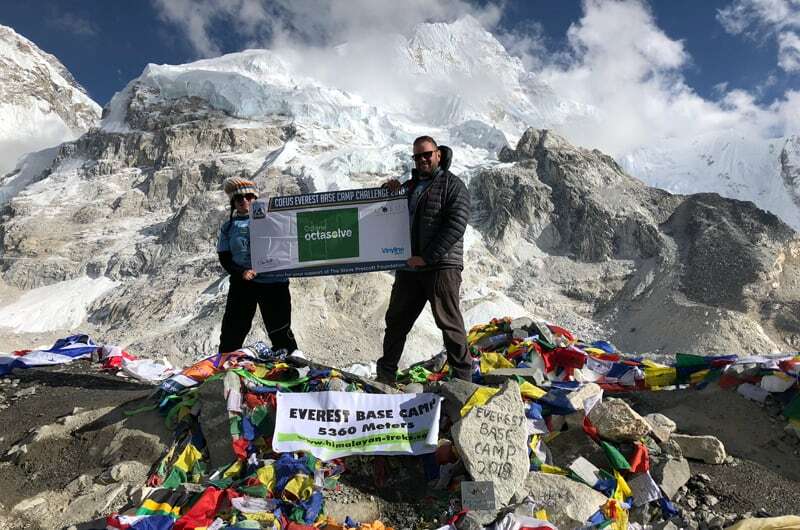 Ian carried a flag for 8 days as he trekked to Everest Base Camp, where he officially marked the launch of our exciting new fuel additive with the placing of an Octasolve flag, 5360 metres up. We are so proud of Ian for his accomplishment. And are so grateful to have had the opportunity to support this amazing challenge, for such a worthy cause that will touch so many lives. We have always been deeply inspired by the incredible work the Steve Prescott Foundation do. And to be able to mark the launch of our product in such a meaningful way, by supporting a member of the Everest Challenge team, was a wonderful opportunity and experience to be part of. We’d like to extend our heartfelt congratulations to Ian and his fellow 26 challengers, who to date have raised £181,691.01 for the SPF! Richard Sykes is a Director of Octane Holding Group Ltd and has worked in the pump and tank industry for over 25 years starting off as a sales representative. When he’s not helping drive Octane forward, he likes spending spare time with his family, walking, watching sport, DIY and carrying out his part time role as taxi driver to his 4 children.